The kale is a nice for a change, especially this time of year. After deveining and chopping the kale into small pieces it’s all about the dressing. In an empty Ball or peanut butter jar add one whole egg, a chopped garlic clove, an anchovy or squeeze of anchovy paste, a dollop of Dijon mustard, and a half inch of extra virgin olive oil. Insert your stick blender so it’s resting on the bottom of the jar and blend on high while slowly lifting the blades up through the mixture. Once it starts to thicken add another half inch of oil, kosher salt, black pepper, and lemon juice, then blend for another ten to twenty seconds. You could probably use the same technique in a blender or Cuisinart but I've never tried. 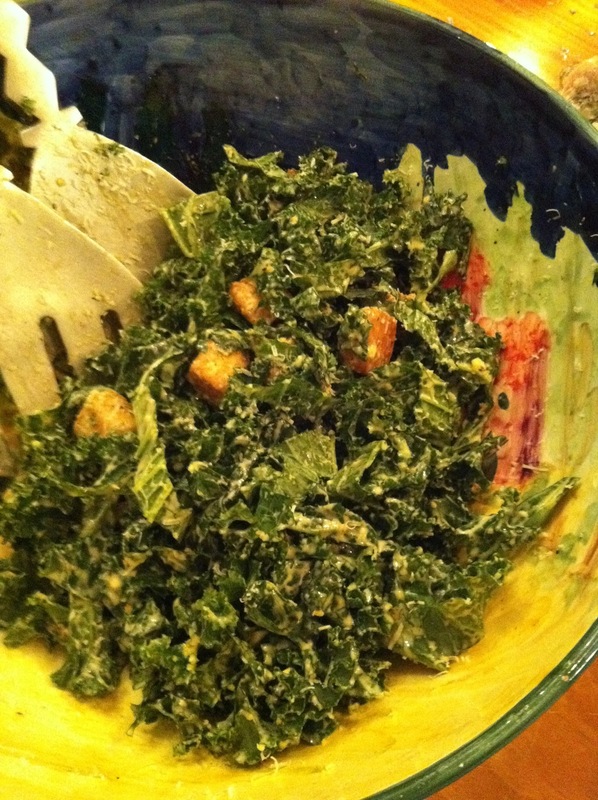 Regardless, it’s important to let it sit for fifteen minutes before tossing with your kale, parmesan, and croutons. You will never buy another bottled Caesar or go to the trouble of whisking again. ok this I can do. We grow kale every year and it always ends up in a sautee of some kind which my husband Alfred kindly tolerates, poor guy. Perfect- look forward to it. I love my caezar salads, so adding a new vegetable might even lure my kids into another dimension. If it doesn't go well I might have to attend food therapy or just blame it all on you David! Can I send you a pic? thanks for the fun!